The first time this plant really entered my radar was last fall when Martha's florist [L & Jay] used it in our bridesmaids bouquets (see below). I'm holding Marth's bouquet in my left hand, and the bridesmaids bouquet in the right. 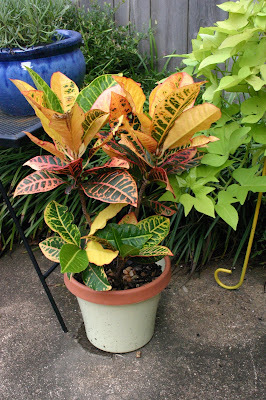 See the clever use of croton as the bouquet base! 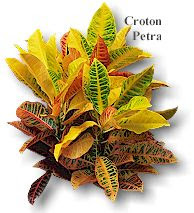 My mom and grandma have always loved and grown croton on their own patios, so after noticing how beautiful it was in our bridesmaids bouquets, I very willingly accepted an offshoot of my mom's croton plant. Here she is on my patio, filling in very nicely. One of the draws of this plant is that one never knows what colors the leaves will be. Will they be prodominantly red, or will you have more greens and yellows? They love sun and maintain their lushness through the summer! Look at all those different shades of beautiful autumn colors! 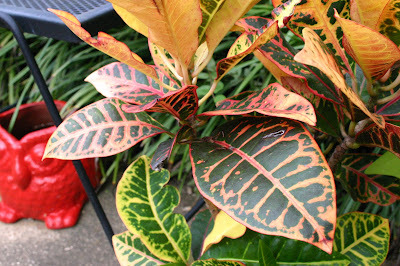 So, next time you see croton plants for sale at the grocery store, disregard the sterile/industrial backdrop and picture it in your own garden. Think of it as a welcome and somewhat unexpected addition to the mums and pansies you'll be planting. 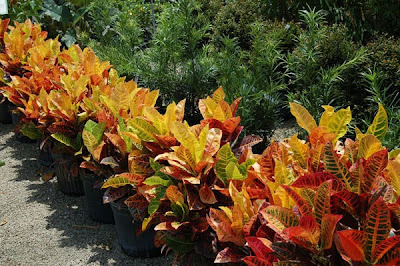 The undpredictable colors you invite into your yard will be most welcome! 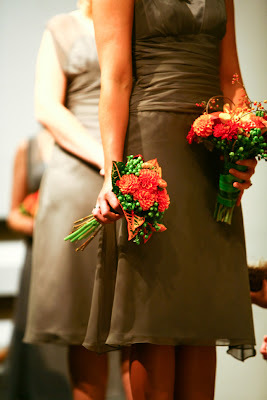 I love fall and the bouquets from my wedding. Too bad you didn't save yours and get it freeze dried. Your crotan plant is doing very well. I like crotans on my salad.